"This new storm is a completely different kind of beast compared to anything we saw on Saturn previously with Cassini. The fact that such outbursts are episodic and keep happening on Saturn every 20 to 30 years or so is telling us something about deep inside the planet, but we have yet to figure out what it is." New images and animated movies from NASA's Cassini spacecraft chronicle the birth and evolution of the colossal storm that ravaged the northern face of Saturn for nearly a year. These new full-color mosaics and animations show the storm from its emergence as a tiny spot in a single image almost one year ago, on Dec. 5, 2010, through its subsequent growth into a storm so large it completely encircled the planet by late January 2011. 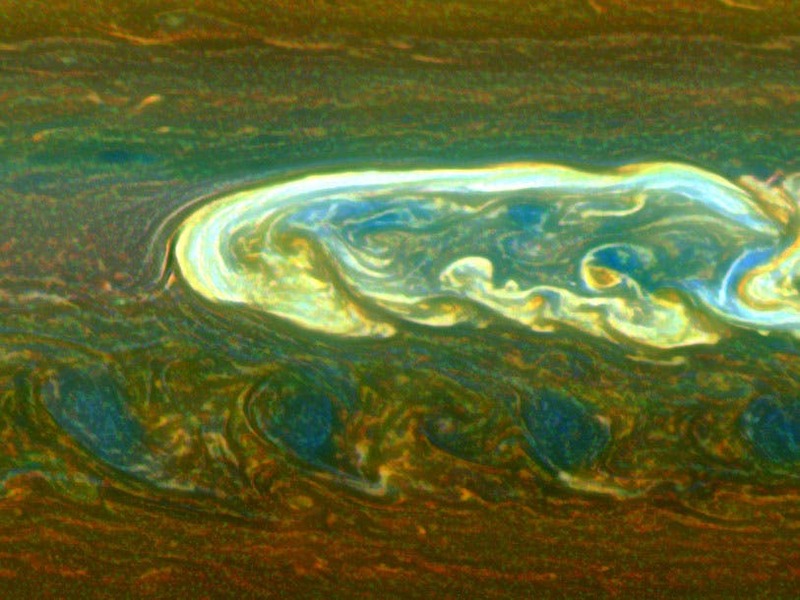 The monster tempest, which extended north-south approximately 9,000 miles (15,000 kilometers), is the largest seen on Saturn in the past two decades and is the largest by far ever observed on the planet from an interplanetary spacecraft. On the same day that Cassini's high-resolution cameras captured the first images of the storm, Cassini's radio and plasma wave instrument detected the storm's electrical activity, revealing it to be a convective thunderstorm. The storm's active convecting phase ended in late June, but the turbulent clouds it created linger in the atmosphere today. 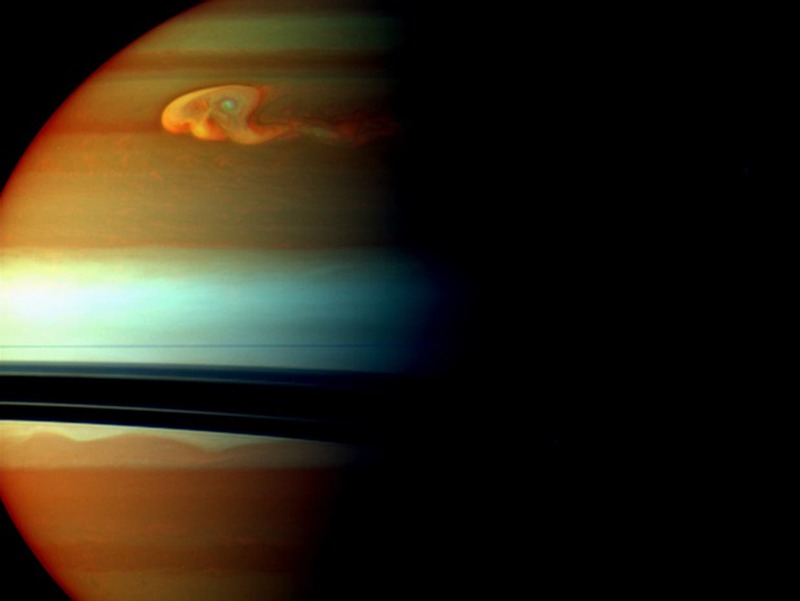 The storm's 200-day active period also makes it the longest-lasting planet-encircling storm ever seen on Saturn. The previous record holder was an outburst sighted in 1903, which lingered for 150 days. The large disturbance imaged 21 years ago by NASA's Hubble Space Telescope and comparable in size to the current storm lasted for only 55 days. The collected images and movies from Cassini's imaging team can be seen at http://www.nasa.gov/cassini , http://saturn.jpl.nasa.gov and http://ciclops.org . They include mosaics of dozens of images stitched together and presented in true and false colors. "The Saturn storm is more like a volcano than a terrestrial weather system," said Andrew Ingersoll, a Cassini imaging team member at the California Institute of Technology in Pasadena. "The pressure builds up for many years before the storm erupts. The mystery is that there's no rock to resist the pressure – to delay the eruption for so many years." Cassini has taken hundreds of images of this storm as part of the imaging team's "Saturn Storm Watch" campaign. During this effort, Cassini takes quick looks at the storm in between other scheduled observations of either Saturn or its rings and moons. The new images, together with other high-quality images collected by Cassini since 2004, allow scientists to trace back the subtle changes on the planet that preceded the storm's formation and have revealed insights into the storm's development, its wind speeds and the altitudes at which its changes occur. The storm first appeared at approximately 35 degrees north latitude on Saturn and eventually wrapped itself around the entire planet to cover approximately 2 billion square miles (5 billion square kilometers). The biggest disturbance Cassini had previously witnessed on Saturn occurred in a latitude band in the southern hemisphere called "Storm Alley" because of the prevalence of thunderstorms in this region. That storm lasted several months, from 2009 into 2010. That disturbance was actually a cluster of thunderstorms, each of which lasted up to five days or so and affected only the local weather. The recent northern disturbance is a single thunderstorm that raged continuously for more than 200 days and impacted almost one-fifth of the entire northern hemisphere. Current plans to continue the mission through 2017 will provide opportunities for Cassini to witness further changes in the planet's atmosphere as the seasons progress to northern summer. "It is the capability of being in orbit and able to turn a scrutinizing eye wherever it is needed that has allowed us to monitor this extraordinary phenomenon," said Carolyn Porco, Cassini imaging team leader at the Space Science Institute in Boulder, Colo. "Seven years of taking advantage of such opportunities have already made Cassini one of the most scientifically productive planetary missions ever flown."